The U.S. Bank Tower in downtown Los Angeles, the tallest building west of the Mississippi, is illuminated in the colors of the Belgian flag following the Brussels attacks. 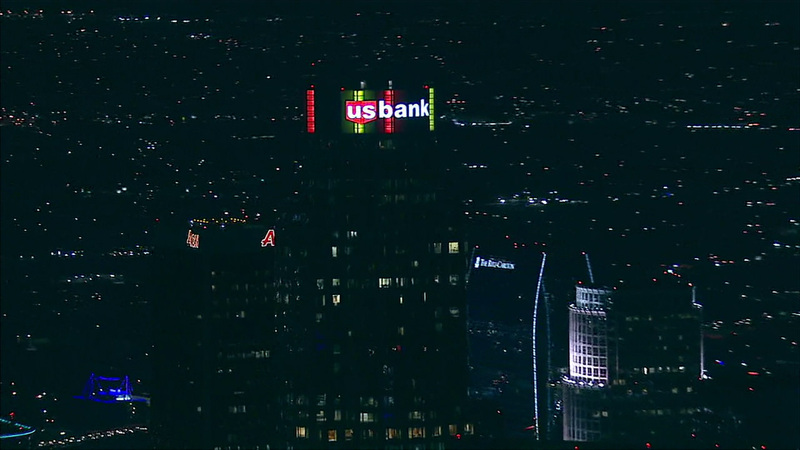 DOWNTOWN LOS ANGELES (KABC) -- The U.S. Bank Tower in downtown Los Angeles was illuminated in the colors of the Belgian flag Tuesday evening in a show of solidarity following the Brussels attacks. Air7HD captured video as black, yellow, and red graced the tallest building west of the Mississippi River. Landmarks around the world displayed their support for Belgium following back-to-back bombings of the Brussels airport and subway. The Islamic State group claimed responsibility for the attacks that killed more than 30. Following the attacks, Belgian police released a surveillance photo of a suspect.